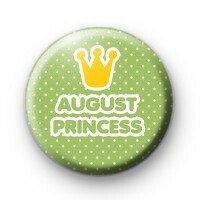 This is a green 1 inch pin badge with August Princess written in a fun bubble style font on a green and white polka dot background with a golden crown at the top. This is for anyone celebrating their birthday during the month of August. A birthday is the perfect occasion for a button badge. We have a huge selection of birthday badges available on the website so be sure to have a browse. Hand made in the UK using metal badge parts with a copper D Pin back and a plastic coated printed badge design.